Jack Nicklaus, also known as "The Golden Bear", is regarded by many as the greatest professional golfer of all time. Over the course of this 25-year period of 100 major championships as a professional, Nicklaus finished either first or second 36 times, in the top three 45 times, the top five 54 times, and the top 10 67 times. 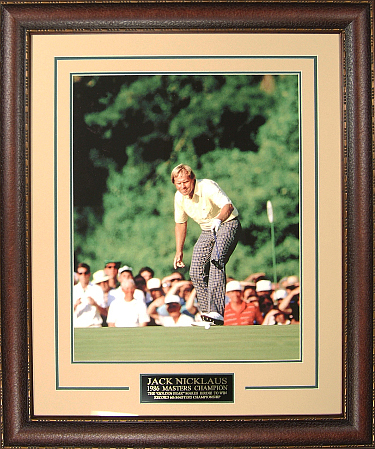 This is a Jack Nicklaus unautographed 16X20 photo with Custom V Groove Matting and Premium Leather Framing. A great photo of Jack from his 1986 Masters win.